1. 1pc top + 1pc pants underwear + 1pc mermaid tail. 2. Design: The tail is opened, easy for wearers to stand and walk around; Bow at the waist; The leg holes of the shorts are trimmed with ruffles for a finlike look; The top is designed to be like two seashells. 3. Best birthday gifts for little girls and baby girls who have a mermaid dream. 4 Attention: Not for new swimmers, adult supervision required. 5. 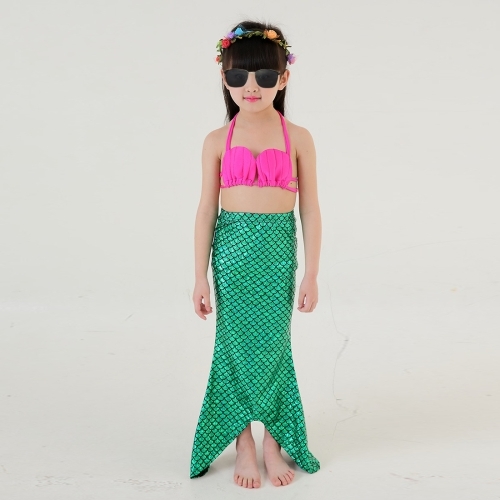 Perfect mermaid costume for Cosplay, theme party, Halloween Party, beach holiday, pool party, and so on. 6. Hand wash recommend. Cannot be soaked, without detergent, air dry without sunlight. 7. Size: 110cm, Tail skirt length: 78cm, Hip/Waistline: 58cm/46cm, Bra length/width: 13.5cm/14cm, Pants length: 22cm, Pants Waistline: 54cm.